My son has two new obsessions: football and cotton candy. For the record, I'm equally supportive of both. We took him to a BC Lions game the other day and appropriately indulged in all the favourite sporty snacks: pretzel dogs, popcorn, gatorade, pop (no pop for kiddo -- apparently I draw the line somewhere) and a big honking cloud of cotton candy. To see his favourite sport up close was the highlight of his year -- but to celebrate the day with brightly dyed spun sugar? Well, heaven all around. Suffice to say, cotton candy is now a much asked for flavour in the baking department, although, if you ask me, nothing comes close to the real thing. These cotton candy cupcakes, however, are a very close replacement, and brightly capture the spirit of fairs, festivals, and stadiums. Even better? There's no dairy for anyone with dairy allergies or lactose intolerance. Hurrah! 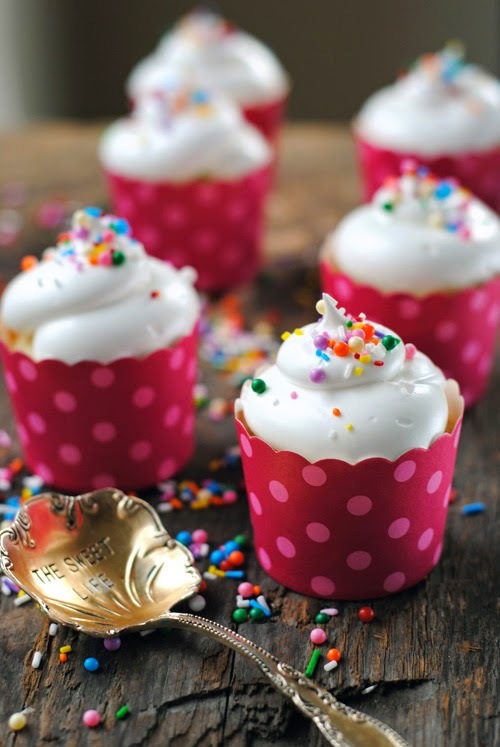 Preheat oven to 350F and set aside a muffin tray lined with cupcake papers, or a baking tray lined with baking cups. In a large bowl, combine the flour, sugar, baking powder, baking soda, and salt. Make three wells in the mixture, and pour the oil into one, the vinegar into another, and the cotton candy extract into the last. Pour over the water, then whisk until combined. 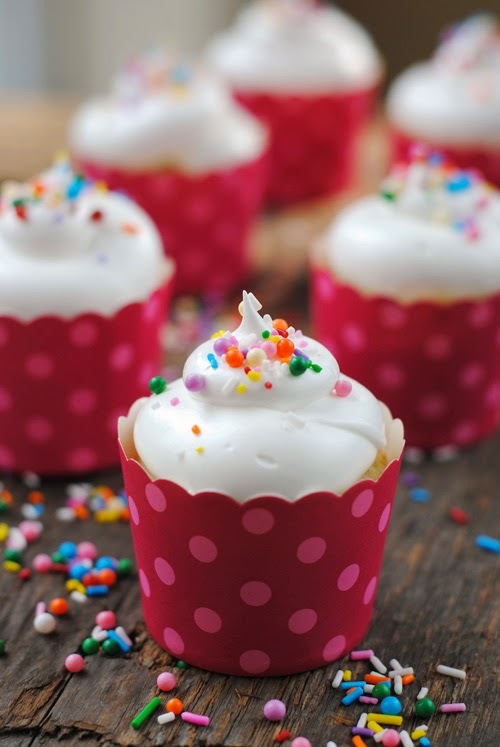 Spoon into cupcake liners -- 2/3 full if using a muffin tray, but 1/2 full if using baking cups. Bake for 13-18 minutes, until golden brown and a toothpick inserted in the middle comes out clean. While the cupcakes cool, prepare the icing. Combine 1/2 cup of the water with the sugar and honey (if using), in a small pot. Bring to a boil over medium high heat, stirring frequently, and set aside to cool slightly. Gently pour the sugar mixture into the meringue mixture while beating on low. Switch the mixer to high and beat the crap out of it until slightly stiff peaks form. Mix in the vanilla, and you're done!